Budget cuts have left many Canadian aviation experts worried about the possibility of a future accident. Canada has one of the best aviation safety rankings in the world, and Air Canada is widely considered one of the safest airlines to fly. However, a recent survey of aviation inspectors for Transport Canada reveals that budget cuts have left many Canadian aviation experts worried about the possibility of a future accident. The survey, which was released by the Canadian Federal Pilots Association, shows that an alarming eight in 10 aviation inspectors predict that Canada will see a major flight disaster within the next few years. Furthermore, inspectors say that many of Transport Canada’s pilot inspectors lack the training to perform their duties. According to survey respondents, licensed pilot inspectors are supposed to maintain their own flight licenses. However, many fly so infrequently that they have been “grounded,” meaning they are themselves unable to fly. Respondents claim that a 60 percent budget cut in the Civil Aviation Flying Program is partly to blame for the decrease in qualified pilot inspectors. The survey also reveals that just 70 percent of the inspectors surveyed said they had received the proper training to do their jobs. The national chair of the Canadian Federal Pilots Association also claimed that some of the inspectors tasked with overseeing helicopter companies don’t actually know how to fly a helicopter. The last major Canadian aviation accident occurred in 2015, when an Air Canada flight hit an antenna array and crash landed at a Halifax airport, injuring 25 passengers. The last fatal aviation accident involving a Canadian aircraft occurred in 1983, when a fire broke out on a flight, killing 23 passengers. If you have been injured in an aviation accident, or you have lost a loved one in an airline crash, protect your rights as soon as possible. 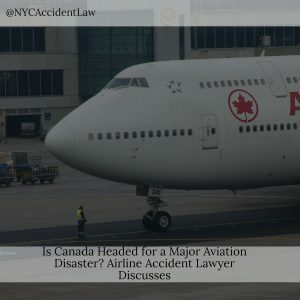 Talk to a New York City airline accident lawyer today to discuss your options.